UNIONDALE, N.Y. - Washington Capitals forward Nicklas Backstrom knew he had an opening once New York Islanders captain John Tavares lost his stick along the boards. Stopping and turning just inside the blue line, Backstrom snapped a shot that went through a crowd and sneaked inside the left post 11:09 into overtime to seal a 2-1 win on Tuesday and even their first-round playoff series at 2. "I didn't know it was going to be a goal," Backstrom said. "I was just trying to get the puck on net." And just like that, this back-and-forth series is heading back to Washington for Game 5 on Thursday with another swing in momentum. 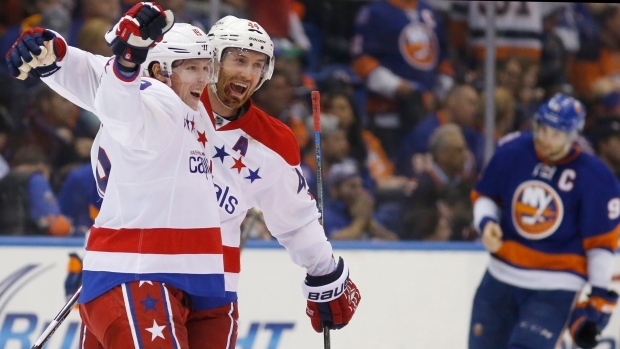 Backstrom and Alex Ovechkin each had a goal and assist, and Braden Holtby made 36 saves. "It's just one game, but we're happy about this one," Backstrom said. "We kept battling." It was the second consecutive game in this series decided in overtime, after Tavares needed 15 seconds to seal the Islanders' 2-1 win on Sunday. Now it's the Islanders' turn to regroup after they failed to rally in front of another raucous crowd in their final season at Nassau Coliseum. Casey Cizikas scored for New York in a game the Islanders outshot the Capitals 37-30 and failed to capitalize on four power-play opportunities. "Three straight power plays, and we didn't generate a whole lot," New York coach Jack Capuano said. "You look back at the game, that's a turning point for me." The Islanders have failed to score on all 10 power-play opportunities against Washington. And it seemed only fitting that a lost stick led to the defeat. Two of Washington's goals in a 4-3 come-from-behind win in Game 2 came after Islanders players were playing with broken sticks. "I've never seen anything like it to be honest with you," Capuano said. "I don't know if he shoots the puck if Johnny has his stick on the puck." Backstrom delivered by winning a faceoff to the right of the Islanders net, He eventually got to a loose puck in the right corner and worked his way up the boards. Backstrom's shot went through a crowd, and with linemate Joel Ward providing a perfect screen in front. "Nick Backstrom was all-world today," Capitals coach Barry Trotz said. "He was outstanding, and Ovi was a big load on the one goal there." The Capitals had two of the best scoring chances to open overtime, and both set up by Marcus Johansson. Five minutes in, he circled the Islanders net and sent a pass through the middle to Evgeny Kuznetsov, who was stopped by Jaroslav Halak. Three minutes later, with the Isles caught on a line change, Johansson got the puck at the New York blue line and passed to Jason Chimera breaking in alone. Halak kicked out his right pad to make the save. Halak finished with 28 saves. Ovechkin opened the scoring at 13:06 of the first off a faceoff to the left of the Islanders net. Backstrom won the draw and got the puck back to John Carlson at the right point. Carlson blasted a shot which Ovechkin deflected in while cutting across the middle. It was Ovechkin's second goal of the series and only second in 13 road playoff games dating to Game 2 of Washington's second-round series against the New York Rangers on April 30, 2012. Cizikas tied it with 13 seconds left in the opening period. Cal Clutterbuck sparked the play by driving through the middle and getting off a bouncing shot. Holtby stopped the shot, but couldn't control the rebound which Cizikas flipped in while driving to the left post. Islanders veteran defenceman Lubomir Visnovsky did not return after being bowled over by hard-charging Capitals forward Tom Wilson in New York's right corner early in the second period. Visnovsky was slow to get up and held a towel to his nose while skating off to the locker room. Wilson was penalized for charging. Capitals defenceman Brooks Orpik had a scary moment when he was cut across the right side of his face by Carlson's skate blade with a minute left in the first period. Orpik immediately dropped his gloves and skated toward the gate leading to the Capitals' locker room. He returned for the start of the second period. Orpik was falling forward over Carlson during a scramble in front, when the toe of Carlson's skate caught Orpik just to the right of his mouth. NOTES: Trotz made two changes to his lineup. Rookie LW Andre Burakovsky made his playoff debut and C Michael Latta returned after sitting out the past two games. Curtis Glencross sat and Eric Fehr will miss at least two games after sustaining an upper-body injury in Game 3. ... The Islanders have not advanced past the first round in their previous six playoff appearances. They last did it with a 4-2 series win against the Capitals in 1993. ... The Capitals scored the opening goal for the first time this series.